Where do you live? Lincoln, Nebraska. Explanation of your handle: At one time I was thinking of legally changing my name to Mom - what with all my kids friends calling me that, and all - and I spend as much time as I can on my bike. Age (general or specific): Late 40's. 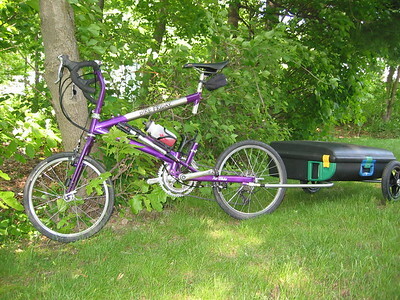 William, the new Sun EZ Sport recumbent. Fastest speed on a road bike? where? when? 34 or so coming down a nice hill by Nebraska City on Walter. We were coming home from a 2-day mini tour and I had full panniers on at the time. I probably should have been scared, as the cross wind was giving the ride some zest, but I have a pretty high guts/brains ratio. I have hopes of finding a faster hill with William some day soon. What is the biggest lie you've ever told: That's classified. OK, either it was the moment I realized that I could go 'most anywhere on a bike, so maybe I should. OR it was the time I decided to combine bicycling and walking my doberman. (That guts/brains ratio, again. It worked for us, but don't try it yourself) After that we went many happy/exploratory miles together. OR my Dad giving me freedom by showing my snotty pre-teen self how to fix a flat - the job needed a wrench or two back then. OR the time DH & I were riding along talking, and I got a mouthful of used spider web. DH says he's never heard me make THAT combination of sounds before or since. OR my wobbly first ride home on William. I really wanted to ride him home from the bike shop, so I did. Most fun ever had on a bike? That glorious summer that my friends & I spent going to summer school & taking the long way home (from driver's ed.). OR a certain fall ride just as the foiliage was at its explosive finest. OR the afore-mentioned mini-tour with DH. OR the ride I'm on at the moment (I said I could be fickle.) Actually I'm not riding at all for a while, not while there is a layer of ice on everything. Give big space to the festive dog that make sport in the roadway. Avoid entanglement with your wheel spoke. Where do you live? New Zealand, although I'm off to the UK on a working holiday soon. Explanation of your handle: Well, the kiwi part should make sense now that you know I'm from NZ. The tl stems, in a round about way, from an old nickname. Occupation: Primary teacher (that's elementary school, for those of you that don't speak any language other than American). Favorite bike: I'm only just getting into this whole biking other than just to get from A to B thing, so I really haven't ridden enough bikes to have formed an opinion. What's in your stable? 2004 Mongoose Rockadile AL. An entry level bike, but it does what I need and I got a good deal. Another picture of yourself or your ride? No pics of me, but you can see my bike here, although mine is smaller than that one; I'm only 160cm tall (5'3"). What is the biggest lie you've ever told? Do I have to pick just one? Nah - I don't really go for flat out lying, but I'm a pro when it comes to leaving out parts of the truth I'd rather other folks didn't know. Most fun ever had on a bike: Dunno that I have one particular moment, but I always really enjoy the small triumphs. You know, getting to the top of Hell Hill without having to dismount, not geting stranded in The Sandpit of Doom, forgetting which exact roots actually were The Treeroots of Death the first several times I went over them. Last edited by DirtDiva; 01-06-2005 at 01:34 AM. Where do you live? UK, but shortly about to move to New Zealand! Explanation of your handle: Second passion in life is photography - first passion is being on a bike with a camera in my backpack! Explanation of your avatar: Thought it summed me up! Occupation: Work at a university, doing administrative stuff, but only have 16 more weeks to go - wahay!! What's in your stable? 7 bikes in all - 4 belong to me! Litespeed, Raleigh Ride 300 (hybrid), custom built road bike (local frame builder) and a Diamond Back M10 (won in a prize draw a month ago). Fastest speed on a road bike? 64 mph when out on a pootle. Another picture of yourself or your ride? Better behind the camera than in front of it. What is the biggest lie you've ever told? See above question regarding fastest speed! Most memorable moment on my bike: Riding my Raleigh chopper at the age of 7, with the wind whistling past my ears, and feeling my heart & soul so full I thought they'd burst (also had the tune to ELO's "Mr Blue Sky" in my head, for some reason!). Halcyon days. 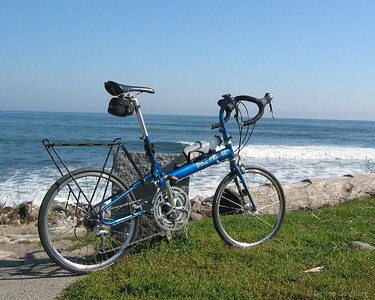 Most fun ever had on a bike: Cycling at top speed down the highway from the Golden Gate Bridge to Sausaulito. --> well, that's because my name is Alice. Another picture of yourself or your ride? --> i guess when i first learned to ride a bike without training wheels...at the age of 16. i know, i'm a loser. --> um. well, riding my bike around downtown toronto at night. I got to know the city much better that way. I enjoyed riding down to the harborfront, watching the boats and listening to the waters. Last edited by *Alice; 01-06-2005 at 10:01 AM. Explanation of your handle: that's pretty obvious! Favorite bike: can't decide between my Aegis Swift and my Bike Friday. Love 'em both! Fastest speed on a road bike? where? when? ~50 mph on a tandem - years ago. Most memorable moment on my bike: Whizzing by other cyclists at the Seagull Century in 2003 on a fast tandem with my husband. We no longer own it, but it was a rush! Most fun I've ever had on my bike: I've racked my brain and just can't come up with one specific ride or event that was the "most fun". Those special times riding along when the temperature is in the 70s to low 80s, the sun is shining, the road tilts gently downhill, there's no traffic, and the wind is at my back are the most fun I've ever had on a bike. Wheeeeeeeee! Thanks for starting this thread, Corsair! Explanation of your avatar: Ditto the comment that “I'm lazy and I haven't gotten around to finding/creating one yet” See? Can’t even create my own answer. Age (general or specific): Physically, 45. Mentally? I refuse to answer the last. I’d have to lie. Occupation: Paying homage to the paycheck gods so that my biking/flyfishing/knitting habits can be supported. Rehab for this is too frightening to be considered, so I spend lots of time in prayer. Fastest speed on a road bike? where? when? 48 on a single going down Howell Mountain into the Napa Valley. 60-god-knows-what on the tandem going down some hill into Napa, hit a steel-decked bridge and learned to fly. Thank goodness our balance is good on the thing and Bubba is an excellent captain. Another picture of yourself or your ride? This is the last mtb trip we took in southern Utah. Some of them are a bit repetitive but we had a lot of thunderstorms which means you focus on riding and not picture taking. Proud to say that all the boys wanted my “Ride Like a Girl” socks at the end. See if you can guess which one is me. What is the biggest lie you've ever told: Me? Lie? Most memorable moment on my bike: Too numerous to pick one. After 4 knee operations in my early 20s and recent diagnosis of MS, every one can be special (I am such a sap – I cry over everything). My husband says that I’m two different people on and off the bike. Off the bike I’m cautious and I am not much of a thrill seeker. But when I’m on my mountain bike, I’m adventurous and I don’t worry about getting muddy! He named the mountain biker personae “Adventure Girl”. Well… Life is good!! Especially when you’re on your bike! It wouldn’t be nice to show favoritism! Fastest speed on a road bike? where? when? Tightly tucked, with the wind, big ring, cranking hard! And my odometer had just been recalibrated. My first 24-hour endurance race. I loved ever second of it—even racing alone at 2:00 in the morning! Commemorative Immigrant Trail out of Truckee, California. It’s like a roller coaster for miles! I rode it with my husband and my cousin and it was as close to a perfect ride as I have had! This is why I ride! Explanation of your handle: My favorite visitor at the back porch feeder. Explanation of your avatar: Haven't got one yet but I'm working on it! What's in your stable? My trusty Giant Cypress DX. Fastest speed on a road bike? where? when? 26 mph (I broke the speed limit!!!) down a long hill just off the municipal bike path this past summer on ol' trusty. Another picture of yourself or your ride? Me (in orange) at the Tour de Cure. What is the biggest lie you've ever told: That I could speak French...HA! Most memorable moment on my bike: Just about every time I go out, I am surprised again at what a wonderful, meditative, renewing experience it is to ride. It gives me such a sense of strength and freedom - something sorely missed as a parent with kids still at home! Most fun ever had on a bike? Giving mountain biking a try and not falling off the mountain! I never knew biking could be so three-dimensional! No kids, only dogs. Used to show in competitive obedience. Just celebrated the 21st anniversary of my 29th birthday. 45 mph on a steep downhill. Put any ride at Disneyland to shame. "It's no problem at all"
To train a dog, you must be more interesting than dirt. What's in your stable? Scott Yecora with about 30% of it's original specs. Fastest speed on a road bike? where? when? Was on a mtb, last decent down to the car on a trail called "Hit the Wall". Fireroad that decends for about 10km, hit 60km/h. Most memorable moment on my bike: Conquering an 45degree off camber hairpin turn around a gum tree at the Dirt Crits!! Woohoo!!!! Last edited by SnowMouse; 01-07-2005 at 04:36 PM. Warning: rider may fall at any time without notice. Explanation of your handle: S is my first initial and Linke (pronounces linkee) is my maiden name. Slinke was my nick for a long long time, and then when Toy Story came out, my husband (then finacee) started calling me Slinkedog. What's in your stable? Specialized Roubaix Elite with all the stock stuff and a computer. Fastest speed on a road bike? where? when? Not sure how fast, but pretty darn fast down a hill on a tandem with my husband driving and me stoking on our honeymoon in Port Townsend, Washington. Since I got a bike of my own with a computer... downhill by my house about 30 mph. I'm a wuss. Biggest lie you ever told: I'm sure I've told some whoppers, but I try really hard not to lie anymore. Most memorable moment on my bike: The above mentioned whilwind tour of Port Townsend on a rented tandem. Most fun I've ever had on my bike: Any time riding with my husband... especially on our anniversary trip this summer to Napa. Last edited by slinkedog; 01-07-2005 at 08:56 AM. Explanation of your handle: I guess I don't have a great imagination - my handle is my name! Explanation of your avatar: Hey - that's me! Favorite bike: Of course I love all of my bikes - can't pick a favorite because they have different purposes. What's in your stable? a Peter Mooney touring bike, a Bike Friday Pocket Rocket set up as a road bike, and a Bike Friday Air Glide set up as a touring bike. Another picture of yourself or your ride? Here's a favorite of me in Wyoming on my cross-country trip back in 2002. Most fun ever had on a bike? Again, impossible to choose. I love the freedom of wandering by bike. Last edited by DeniseGoldberg; 01-07-2005 at 08:20 PM. Click here for links to journals and photo galleries from my travels on two wheels and two feet. "To truly find yourself you should play hide and seek alone." Real name: Joanne, but you can call me Jo (please). Explanation of your avatar: I like the training wheels... I consider myself a perpetual newbie, there’s always something new to learn! Favorite bike(s): anything by Rivendell. And the gorgeous lugged steel creations by Columbine and Vanilla and their ilk. What's in your stable? A Riv Romulus (Pokey) and a pre-owned Waterford era Riv Road (Dusty). Fastest speed on a road bike? where? when? I did 38 once going down a long straight smooth hill where there was no hint of a car for at least a mile. Another picture of yourself or your ride? Chrismas Day at the Pulgas Water Temple on Cañada Road in Woodside, with my trusty Dusty. Most memorable moment on my bike: As in, near-death-experience memorable?? That would be the time I was on a club ride and we were going down a nice smooth grade and I was feelin’ good and picking up speed, and next thing I knew I was entering a bend which was much much sharper than I expected. Luckily it was banked well and I had room to maneuver because I negociated that bend at about 30 mph ! Darned if I know how I managed to keep control, it was such a rush when I realized I was going to survive, but I don’t plan to relive that experience anytime soon! Most fun ever had on a bike? First time I descended from the top of Mt. Diablo. We were faster than the cars going down. Wheee! Last edited by jobob; 01-08-2005 at 08:11 AM. Explanation of your handle: My husband is a helicopter pilot, UH-60 Blackhawk. Thunderduck is a Vietnam call sign. Thunderduck60 is our email address. When I signed up I just put down the first thing that came to mind. Explanation of your avatar: avatar? I'll get one someday. Favorite bike: Right now it is anything that gets me on a trail. What is the biggest lie you've ever told: Told my mom I was going shopping when I really went to an Army Recruiter. I don't regrete it since I loved every bit of my time in the service. Most memorable moment on my bike: Jumping a ramp that my husband and his buddy built. They were so proud of me. It is only about 2 1/2 feet high but it felt like 10. It really raised my confindence for future riding. Last edited by T-Duck60; 01-07-2005 at 09:43 PM. Explanation of your handle: duh! Most memorable moment on my bike: So far just getting up some of the horrible hills we have round here without getting off and walking. Most fun ever had on a bike? That's a hard one! I just enjoy getting out on my bike especially on a warm sunny day. I do enjoy going downhill though.